We’ve finally got around to testing the FaceBook Spaces Beta over the past few weeks and we have a lot of mixed feelings about it. On one hand, we really want to love this platform. The idea of a social media giant creating a new market for VR that isn’t directly related to gaming is something we’re really excited by. However, it’s hard to ignore the flaws surrounding the app in its current state. Bummer. 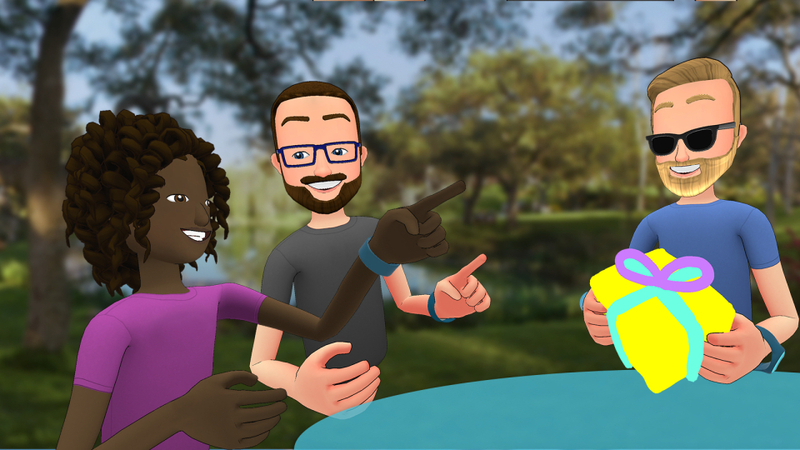 For anyone unaware, FaceBook Spaces is a VR application designed to enable users to ‘hang out’ and interact with each other in an alternate, digital reality space; with the hope of creating new ways for people to communicate and have fun together no matter where they are located globally. The app is compatible with the Oculus Rift and HTC Vive and syncs with user’s FaceBook profiles to allow them to connect with friends. Users can play a few games, view 360 photos and videos, take VR selfies of their cartoon-ish avatars, draw in 3D together and……..that’s about it for now. Outside of these key VR features, users can also perform the basic FaceBook functions such as viewing images, videos and posts, as well as calling and messaging friends – although we can’t pinpoint much benefit to doing these things in VR yet (if anything it’s more hassle when you compare it to the simplicity of performing these tasks on a mobile). When we think of social media, we usually associate it with convenience, ‘fast news’ and communication – it gives us the ability to consume and share information quickly, from anywhere. This is not the case with FaceBook Spaces. We understand it is unfair to directly compare FaceBook Spaces with any pre-existing social network, as it is new and unlike anything else currently available. However, the whole experience is so dramatically different from the way most of us impatiently use social media now that the idea of dedicating lengthier chunks of time to a social media activity feels a little strange and uncomfortable. Although, we do admire the fact that this kind of experience aims to encourage people to take a more dedicated approach to communication, one where friends actually talk and interact in a way that simulates the sense of meeting face to face – a situation which is often pushed aside now thanks to the popularity of texting, emojis and memes. Now, not all of the issues with the experience come solely from the in-app experience. A few of the drawbacks come down to the hard wares themselves. The cumbersome look and feel of the Oculus and Vive hinder the social networking experience due to their lengthy set up times and lack of portability. They remind us that VR still has a long way to go before it fits seamlessly into daily lives, and unfortunately for Mark Zuckerberg the vision of a world where putting on a VR headset is as normal as wearing a baseball cap still seems a way off. On the note of hard ware, we’re intrigued to see what impact new headsets such as Oculus Go are going to have on the use of FaceBook Spaces and VR in general. This powerful yet affordable and wireless alternative to the current Rift could be a game changer in terms of popularisation. We’ll keep an eye growth over the next few months as the headsets are shipped out. You can expect a review from us too! Reading through this article I’m sure you’re thinking we can’t be much of a fan of FaceBook Spaces, but that isn’t the case. We feel very positive about the concept of the experience and the glimpse into the future that it provides. We like the direction FaceBook are trying to take, but they just aren’t hitting the nail on the head yet. FaceBook Spaces is currently hindering itself as more of a clunky add-on novelty to the existing FaceBook experience rather than sitting as a revolutionary digital realm that is going to transform the way we communicate and convince us all to spend hundreds of pounds on the required technologies. We’re still waiting for the ‘wow’ factor that is going to shift the scales in favour of the latter. We think this infantile area of VR probably just needs to time to find it’s feet and grow. We remain hopeful about the technology and we’re certain that as the industry expectations and hard wares evolve, FaceBook will play a large role in the popularisation of social VR and that it will play a substantial role in the future of digital communication. The world just isn’t quite ready yet. Imagery courtesy of FaceBook News Room. Want to see more content like this? Read our last blog post here: ‘The Golden Rules of VR Design’. Want to try FaceBook Spaces for yourself? Enquire about hiring our VR equipment.